Effects: expectorant, analgesic, stimulates the mental activity, antidepressant, antiseptic, anti-inflammatory, antioxidant, anti-vomiting, appetizing, stimulating the function of the adrenal glands, immunostimulatory, insecticides, antispasmodic, tonic, digestive. Benefits: The basil is widely known herb and is used primarily like a spice. The basil oil regulates digestion; it is used to treat colitis, indigestion, constipation, stomach cramps and flatulence. It has refreshing and invigorating effect. It is an excellent analgesic, especially for pains based on nervous stress, migraines, arthritis and muscle pains, and gout. It has a refreshing effect in cases of physical and mental fatigue, helps people with reduced concentration and memory loss, clears the mind and increases the efficiency of mental process. As an antiseptic component the basil oil supports the activity of other oils in treatment of bronchitis, colds, different types of flu, inflamed sinuses. It strengthens the immune system; relieves the effects of insect bites. Basil essential oil is used topically to massage the skin. It enhances the fresh look of tired and exhausted skin and hair. 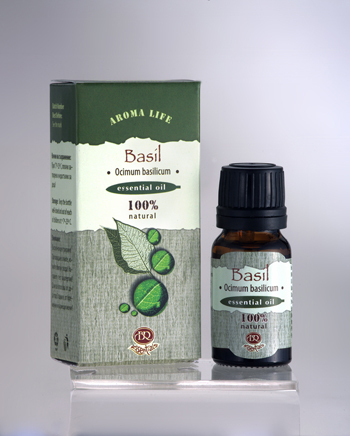 Basil essential oil blends well with bergamot, clary sage, clove bud, geranium, eucalyptus, lime, lemon, juniper, eucalyptus, neroli, marjoram, rosemary and lavender. Application: for massage, baths, compresses, inhalations (aroma lamps), after consultation with aroma therapist. Attention: Contraindecated to epileptics, pregnant women and children up to 3 years, by people with increased blood coagulation or with individual intolerance towards basil.